High temperatures can be lethal to chickens. 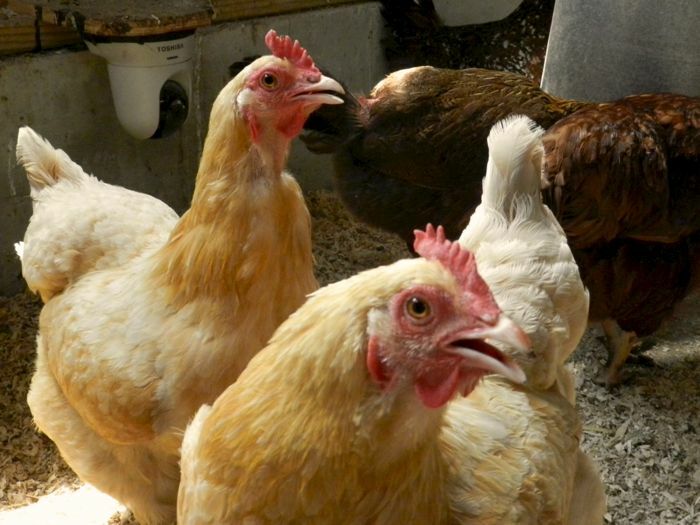 When the thermometer rises, chickens cope by holding out their wings and panting. Egg laying productivity decreases. But all too quickly, these coping strategies fail and your hens will succumb to heat stroke. You’ll know your hens are struggling when they are panting with wide open mouths and are listless. They stop eating and drinking. 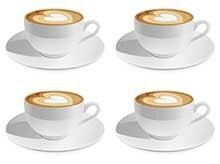 If you see that, they’re in immediate danger. But, don’t despair, good management can help them cope with heat. There are things you can do for so that you don’t have to bring your hens into your air-conditioned living room! Cool, fresh water is the most important thing to provide your flock. 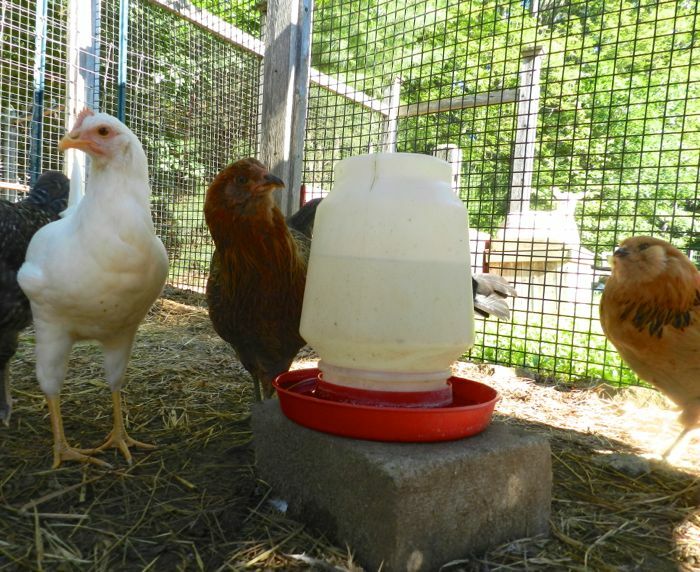 If your waterer is in the sun, or across the yard and in the coop, your hens won’t use that dispenser and they won’t get get enough to drink. Put a waterer in the shade where they hang out. If it’s so hot that even that water is too warm to drink, then chill it off with this trick: fill the waterer halfway and freeze it. Then top it off before setting it out for the hens. 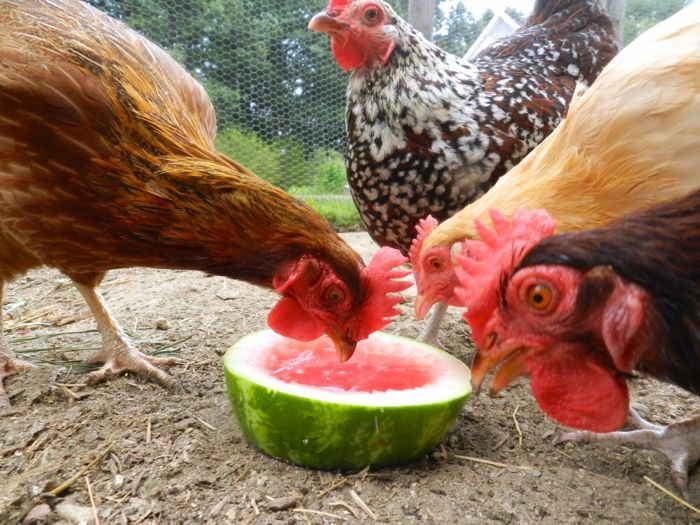 Providing juicy fruits and vegetables also keeps your flock hydrated. Watermelon and cucumbers are especially good, Don’t cut them up. Leave them whole so that it will last. 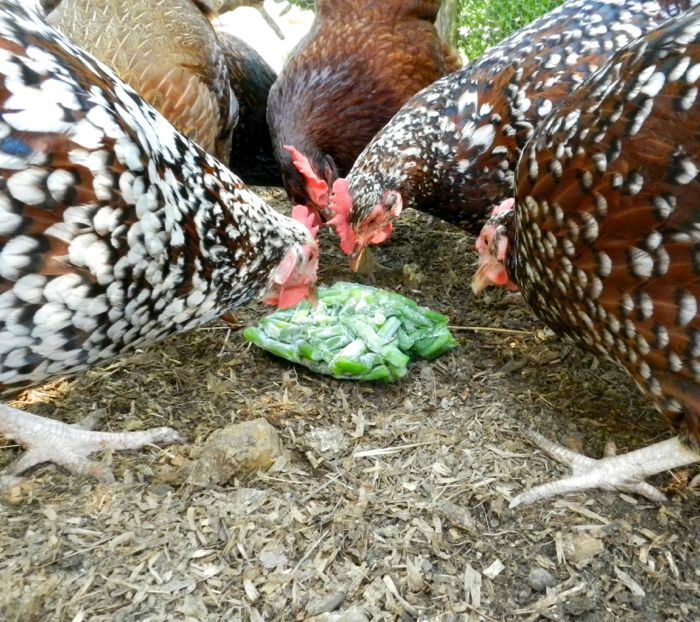 Frozen blocks of vegetables and fruits are also good for pecking at. This is a good time to clean out your freezer. Freezer burn? The chickens don’t care! When temperature rise into the high 90s and it’s so humid that it feels hard to breathe, I’ll dump a bin of ice cubes into the pen. The chickens drink the water as the ice melts. I know people who live in hotter climes than here, who provide misters for their chickens, and cool off their coops by spraying water on the roofs. I don’t have to do that where I live, but when it’s in the high 90s, I’ll hose down the dirt in the run, which brings some relief. Besides, the chickens are fascinated by running water! Your chickens must have shade. 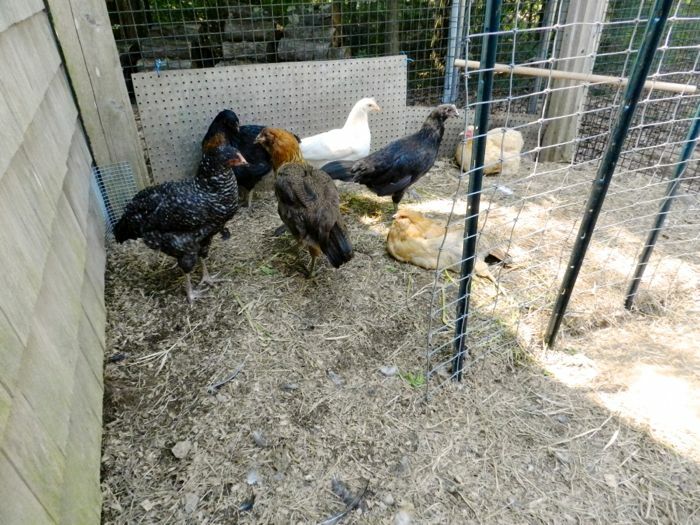 My hens hang out in the compost pile, which is shaded by the barn and trees, and where the dirt is moist and cool. If you can’t site your coop in a shady spot, put a shade awning up. I also put up a shade tarp over a portion of the run. 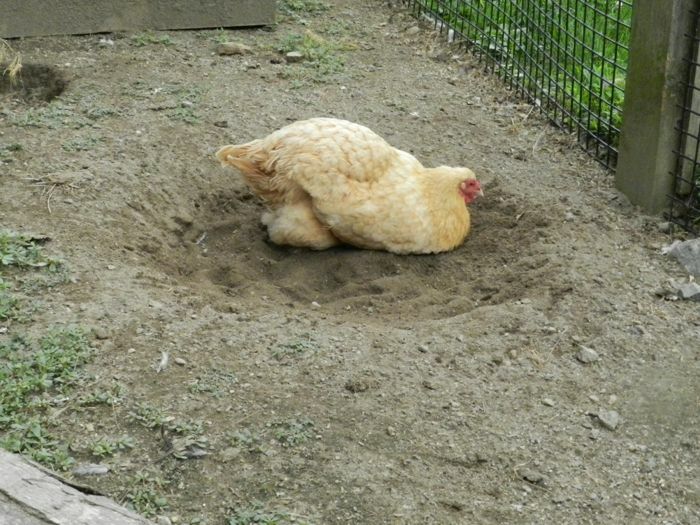 Provide an area with dry, loose dirt where the hens can take dust baths. They’ll wallow down until they reach cool soil. 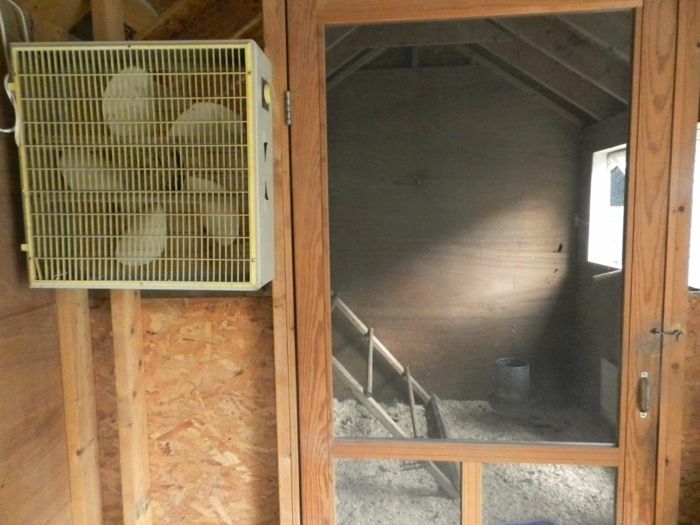 Your coop should be well-ventilated. A cupola that pulls hot air up and out can cool the building down by 15 degrees. If your coop didn’t come with one, you can buy a kit and install it. Windows that open help air flow. 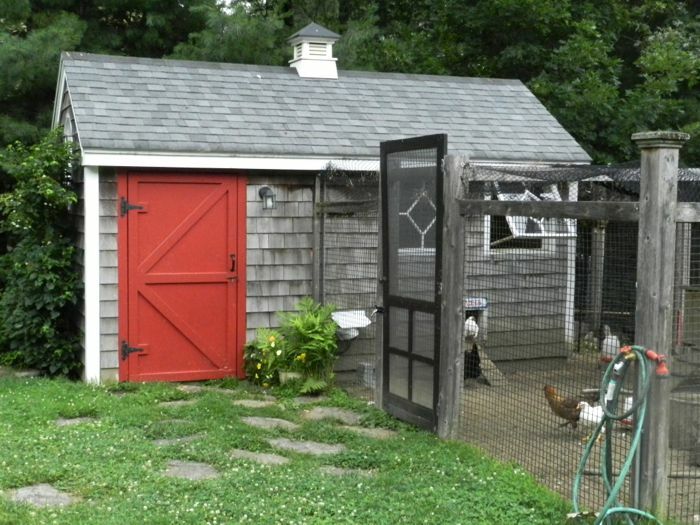 Even small coops should have windows and vents and headroom so that hot, moist air isn’t trapped near the roof where the chickens roost. Even with the heat, the hens will need to go inside to lay their eggs. I’ve hung an old fan to make it bearable near the nesting boxes. Finally, if you live in areas that see long stretches of triple-digit summer days, consider getting heat-tolerant breeds. Leggy, trim chickens with mostly hard feathers, like Leghorns and Andalusians, are designed for hot weather. These are called Mediterranean breeds, and they don’t have the fluffy, heavy, soft feathers of heavier hens like Cochins and Orpingtons. They also have large, floppy combs that help to dissipate heat. So, when it gets dangerously hot, keep an eye on your flock, keep them hydrated, provide shade and airy accomodations. Good advice for anyone, animals or human alike.